Do you require a specific type and size of hydraulic hose assembly? The best way to get the custom hydraulic hoses you need in the Southcoast area is to work with our team at Metro Industrial & Marine Supply. Our team of highly trained and experienced professional hydraulic hose technicians can work with you to create custom hoses in Fall River and the surrounding area that are made to order. We can also create custom hydraulic hose in Fall River while you wait or offer same-day service to ensure you get the parts you need right away. Let our technicians help you with all your needs for Fall River hydraulic services to ensure the effective, efficient, and safe operation of your hydraulic equipment. To get started, the best way to determine what you need is to learn how to properly measure the “overall length” of your existing custom hydraulic hoses and assembly. You might be able to find information about the sizes and types of hoses that are needed by reviewing the owner’s manual or manufacturer’s recommendations for your equipment. However, if you do not have access to this information, the best place to start is by measuring what you are currently using for your hydraulic equipment. 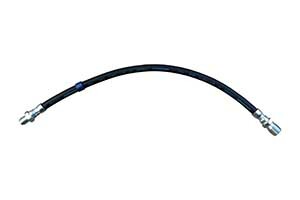 Diameter – Start by choosing the inside diameter of the hose that you will require for your custom hydraulic hoses. Sizes can range from 1/8-inch inside diameter on up to 2-inches inside diameter. You do not want to guess when it comes to this measurement, so make sure you take the time to do it right. Even if you are off by an eighth of an inch, it could result in a poor fit and a potential risk to the operator and other employees or visitors nearby. Length – The next step is to measure the hose assembly length. This can be a bit challenging, depending on the fittings that are used within the assembly for your existing custom hydraulic hose in Fall River. You want to measure from end-to-end for the perfect fit. If your hydraulic equipment utilizes straight fittings at each end, this is quite easy: just measure from the end of one fitting to the end of the other fitting. Angled or combination fittings will need to be measured differently for an accurate fit. If you aren’t sure what you need, consider bringing in the cleaned out hose to our team to have it measured. We recommend keeping records of sizes, lengths, and types of hoses for future replacements of your custom hydraulic hoses. You will also need to know the type of hose that you require for your custom hoses in Fall River. Different kinds of equipment will require different hose materials. There are reinforced rubber hoses, steel reinforced Teflon, coiled, corrugated and articulated, depending on your needs. Other examples include specialty hoses, such as jack hose, jackhammer hose, pressure washer hose, and air hose. Each type of hose is used depending on the medium or fluid that will be conveyed through the hose, as well as the amount of pressure. Low pressure, high pressure, and very high-pressure needs should be stated at the time of your order. Additional options, such as swivel fittings or full-time swivel joints that function under pressure, should also be noted when you speak with our technicians. If you require custom hydraulic hose in Fall River that features straight, angled or combination fittings, you need to make sure to specify how they will be installed. For example, if your custom hoses in Fall River have two angled fittings, you will want to provide the position that they will be installed in for a proper fit. Your fittings might be straight, a 45-degree angle or a 90-degree angle, but the way that they sit on your equipment matters. The best way to provide accurate information is to hold the hose assembly up to the equipment as though you were looking into a telescope. Place the fitting at the far end of the assembly in the twelve o’clock position and then identify the position of the next fitting based on the angle that it would point to make the connection, such as 45, 90, 135, 180, 225, 270, or 315-degrees. If you need custom hydraulic hoses and assemblies in the Greater Fall River area, you can count on our team at Metro Industrial to provide you with top quality products and service. We stock a wide variety of hydraulic, special application, and even general purpose hoses at our industrial and marine supply shop. If you are looking for custom Fall River hydraulic services, make sure to speak with one of our team members about your needs. We have the unique ability to create custom hoses in Fall River while you wait or have them completed with same-day service. Give us a call at 508-996-8400 or stop by our location on Coggeshall Street in New Bedford.